Radha Ashtami, the appearance day of Srimati Radharani, was celebrated at Iskcon Kolkata on 13th Sep. On this occasion a special dress which was prepared in Vrindavan was offered to her. 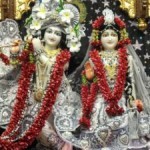 Radharani is an eternal associate of Krishna and she dresses only to please Krishna. Sankirtan Anand Das, a senior brahmachari, explained that Radharani maintains the kitchen of Krishna in the spiritual world. So a special 56 bhoga was offered to Srimati Radharani today. There was special darshan for all. Maha Arati, Maha Abhishek, Pushpanjali, kirtan were other attractions of the day. Srimad Bhagavatam classes were given by Dayaram Das, President of Iskcon Kolkata and Shauri Das, a senior disciple of Srila Prabhupada.